The child's western cowboy gun and holster set is the perfect finishing touch to any child cowboy costume. You can also pair it up with a western cowboy hat to create a quick and easy cowboy costume for Halloween or year round costume dress-up play time. 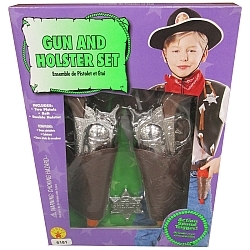 The child's western cowboy gun and holster set is colored as pictured. Set includes, sheriff star, gun belt, 2 holsters, and 2 guns.